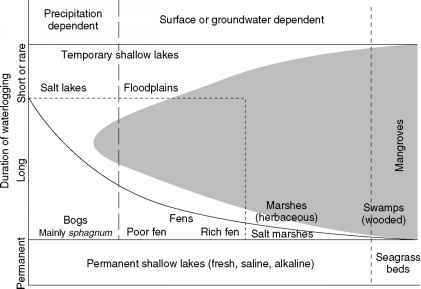 The health of an estuary ecosystem is determined by the dominant physical, chemical, and biological processes, sketched in Figure 1, within the estuary, as well as the natural characteristics of, and the human activities con ducted within the entire river catchment upstream. The robustness of an estuary depends on the rate at which water is flushed; the longer the residence time, the greater the water quality problems. Ecological integrity also depends on the rate at which fine sediments are sequestrated in the estuary (primarily in the tidal wetlands) or flushed out to sea, as well as the efficiency with which organic matter is processed within the water column. This commonly occurs through the bacterial loop sketched in Figure 1 . There are other important relationships between the estuary and its tidal wetlands. The tidal wetlands export or import differ ent particulate and dissolved nutrients, and they are also nursery grounds for fish and invertebrates. Human activities within the river catchment are a major driving force affecting the health of the estuary, mainly as a result of excess nutrients and sediment, a change in natural river flows from human activities, as well as land clearing and overgrazing that increase soil erosion. Such activities modify the natural flows (e.g., dams), and increase the riverine nutri ent load (e.g., sewage discharge, animal waste from agribusiness such as pig farms and cattle feedlots, and fertili zers leaching from farms). All of these activities and processes also degrade the tidal wetlands because of the exchange of water and mass between the estuary and the tidal wetlands. The pressure on tidal wetlands is further increased by dred ging, land reclamation for industry, and urbanization. For instance, nearly all estuarine marshes have been 'reclaimed' in the Netherlands and in Japan. 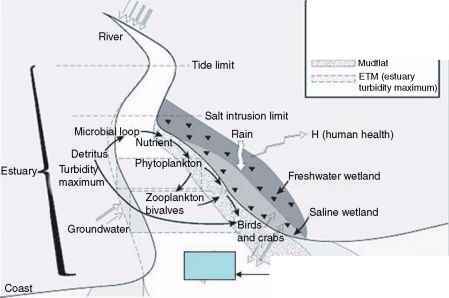 Figure 1 Habitat distribution in atypical estuary and sketch of the feedbacks between physical, chemical, and biological processes that control the health of the ecosystem. Saline wetlands can be mangroves and/or saltmarshes. Coral reefs can exist within the estuary near the river mouth and in coastal waters. Seagrass usually occur between the wetlands and the coral reefs. Coral reef restoring the ecosystem health. It is also a science based technology that is still under development. River in Europe, and the Chesapeake Bay in the USA, however all of these attempts have been hampered by politics. As a result, at best only a fraction ofthe ecological function of these estuaries has been restored. For instance macrophytes - and the biological communities of shrimp and fish that they support - cannot be restored in estuaries as long as activities in the catchment generate turbid waters. In what follows we will describe the present techni ques to restore habitats, mainly tidal wetlands, seagrass, and coral reefs.